It is the stability that makes it all so bearable. Never having to decide. My sacrament runs on established lines. Trinities. Bells ringing at predictable intervals. The bowing. The smoke. The painted snake runs along the inside of our mudded holy place and then out and around the building into the golden rows. The snake becomes the labyrinth within which we seek meaning. What is in the center of god’s heart? How far do we walk to find the center of that maze? The maize that grows in the fields feeds the children who laugh without knowing god nor snake nor sorrow. 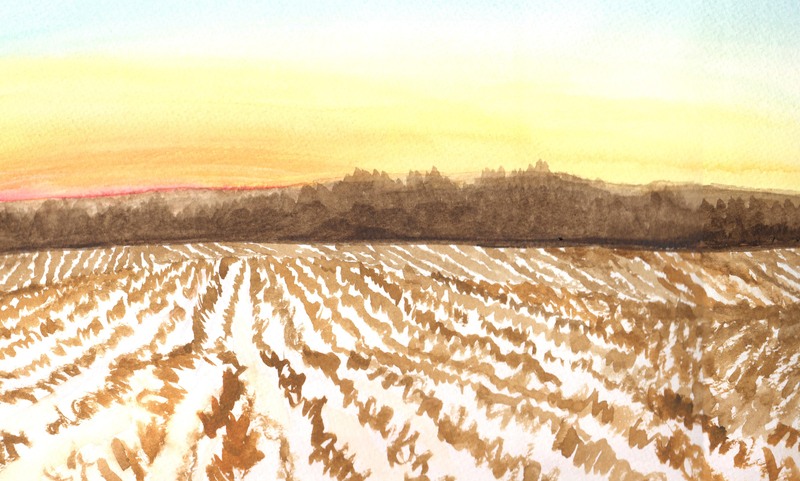 The maize raises its head to the sun until it falls over dead and feeds the cranes while the children sit inside drinking atole, hot liquid corn sweetening short cold days. It is the stability that makes it all so bearable. The stability of the dance that raises the children and buries the elders, the stability of the harvest, the chanting and the secret smoke that talks to the great ones, the ten generations who came before and will come after. Snake does not ascend. Snake lives here, on earth, with us. Like snake, we feel the sun on our backs, and we are warmed from afar. On the Woodtangle Freeway, all the cars drive both too fast and too slow. That’s right. The monstrosity in front of you, the multi-level dead car stacker with the cross-country plates and the smell of burning breaks – drives too fast and too slow. Swerving. Bent mirrors, views from Nebraska but now we’re in Philadelphia and the mirror is all wrong, all wrong. To keep awake, to avoid the tour bus and the singing frogs, I chew bubblegum. My favorite flavor bubblegum is asparagus, which can only be ordered on the internet. When I stop in Nebraska, Arkansas, North or South Dakota or Oklahoma, I strip off my day clothes and climb into the back of my Very Big Truck in my underwear and order bubblegum and red meat off the internet. Don’t order red meat from Amazon; order red meat from AllAmerican.com, where they know where their meat has come from, they know where their meat has been, they’ve driven their meat from here to there, through the simplicity of piano concertos on public radio stations from the redwood forest to the gulfstream waters, this meat was drove for me and you. And the truck driver, who could be you or me, is a minister of road wisdom and road rage; isn’t that the way it is, that the most spiritual among us here in Walmart America is also the most likely to be alone, blessedly alone on mile after mile of the brilliant highways of the CCC. When you sit alone in an 18-wheeler, you can belch or flatulate, you can sing hymns or say prayers, you can curse or praise, you can be a zealot. You are alone, you road warrior, you road guru, you road map you. The path ahead of you is behind you as well, a bead on a string, a tale being told, a verse, held up to the unfolding sky and the stars that lie down on that winding ribbon. You’ve been telling them, you and me, this land, this land, but they look at you like you are a crazy; to believe in us, in the collective, is like believing in the giant squid, is like believing in solid gold silk, is like believing in wonder or white owls or sugar cookies or aliens. But to be a road agnostic is to allow for wonder, to allow for the open space between exits where tales might hover, lonely but waiting, for someone to paint that ribbon all the way from here up into the clear blue sky. As the self disappears, mind watches, skating closer to the mean. Watch out for the non-uniform error! Beware of noise! No regression in my yoga, please; pass the reliable results. It’s not just mind: all things fall apart. until the bloody method is the only thing left. 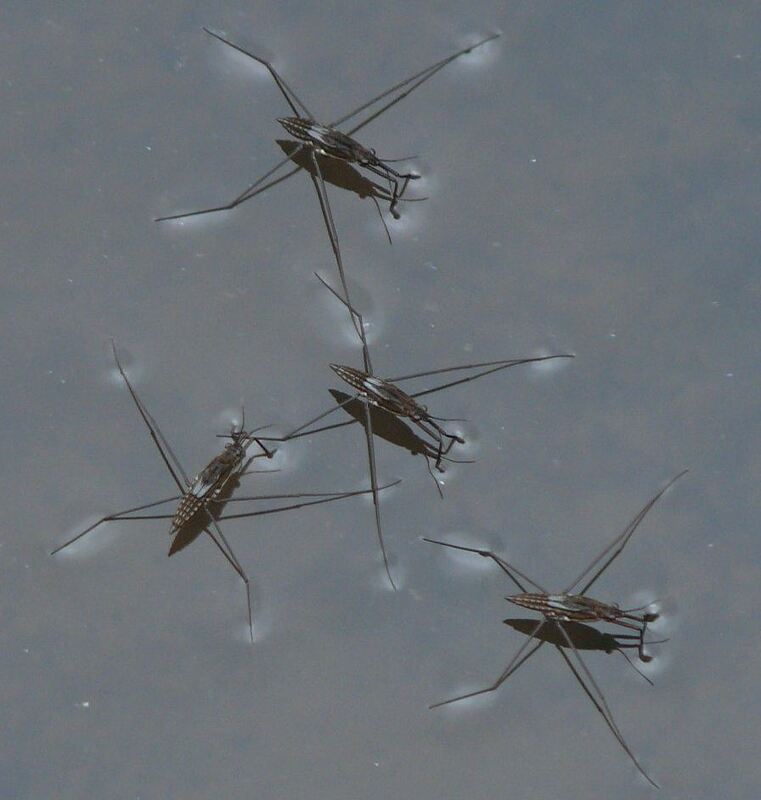 ever away, water striders on a lake in high summer. Whisper I love you, that little dream I dreamed of you, the cat purring, the eggs poaching, the lust arching over an ordinary conversation, the dollop of cream, the whispering cloud of wish, the daylight scatter of toast and laundry. I hear a sigh every year just before the frost comes, the first night when there is an inkling that sheets will want to be warmed before we slip between them. A spatter of rain drops on the windshield, fog rises inside the warm car, lights halo on the shining street. The silence of evening settles when the motor is turned off; sitting in the front seat, shadows sidle anonymous, transient, drawn one breath away. Mystery hangs on hesitant leaves. Reaching, we touch them as they fall, red/gold, into the dark street. Exhale.